This week started off a little differently than most weeks when we have a home district work period. 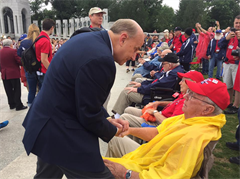 When I learned that the Brookshire Grocery Company was bringing another Honor Flight of World War II veterans, and that at the same time, the Whitehouse High School Band with over 300 students was coming, we got it on the calendar, so I could fly back to Washington to have the exciting privilege of meeting up with them. 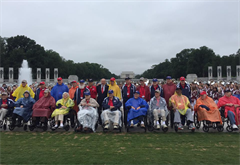 Veterans from Texas came to honor their fallen brothers and sisters in arms on Memorial Day. 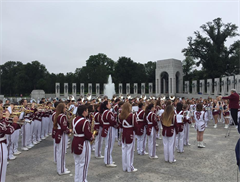 And as an extra treat, the Whitehouse High School Band came all the way from Whitehouse, Texas to play at the World War II Memorial for our veterans and joined a special night tour of the Capitol Building I was honored to host on Monday night. 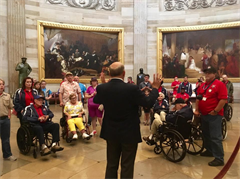 After joining these great Americans in our nation's capital, I came back to the district to meet with groups all over East Texas. The big news this week out of Washington was President Trump's decision to withdraw from the Paris Climate Accord. President Trump is entirely correct in his decision to withdraw. In doing so, he has done what is best for the American people. I had gotten an invitation to be at the White House Press Conference in the Rose Garden on Thursdayafternoon, when President Trump was announcing the U.S. withdrawal from the Paris Accord. However, when I got the invitation it was Thursday morning and I was scheduled to be in Timpson at the time of the Press Conference. 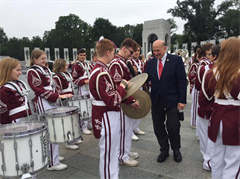 Had a great time at Timpson High School and visiting with leaders of the School District, but sure was proud of what President Trump did. "Nothing is stopping any nation or business from voluntary participation in the standards agreed to by the previous administration that would have crippled our economy. Scores of nations around the world are again demanding that the U.S. must be part of this agreement for one main reason: the U.S. will be paying the rest of the world because we’ve been successful. If people in America want to continue to be the most generous and charitable country in history, the crippling standards should remain voluntary. This agreement would not affect the environment in any significant way as the biggest polluters in the world would continue to pollute. Whether we are part of this Accord or not, Americans will continue to make our environment better . So it is grossly unfair to American citizens and businesses to sign an agreement that intentionally makes Americans far less competitive. In other words, it is the typical leftist agenda of mandating punishment for the most innovative and productive to benefit those who are not. It would be cheaper just to send all of the signatories a participation trophy and stay out of the self-punishing agreement. If we put America first, we can continue to be the most charitable nation in history. If we continue to hurt ourselves economically, there will be no nation left to be so kind and charitable. That is why I say sincerely, 'Thank you, President Trump.'" The Blaze TV - "Dana"
This week, I sat down with Dana Loesch from The Blaze TV to discuss Immigration issues in the United States and how we can fix them. Fox News - "Fox & Friends"
This week, I joined Fox & Friends and discussed a bill presented by Rep. Mo Brooks (R-AL) that takes aims at fixing an immigration system flaw. I noted on the show, "They [Obama Administration] took a good program started under George H.W. Bush for humanitarian purposes, and they turned it in to a program that could be a way to hurt our country - so it needs to stop." WWDB - "Tone and Tenor"
It was great to talk with Randall Jefferson and Maurice Goodman from 'Tone and Tenor' this week and explain a little more why I support President Trump's decision this week to withdraw from the Paris Accord. Listen to the AUDIO, here. Fox News - "America's News HQ"
Sunday afternoon, I talked to Fox News regarding President Trump’s tweets calling out political correctness in the aftermath of the terror attacks in the United Kingdom. I also discussed the upcoming hearing on Russia where former FBI Director Comey has been asked to testify.